El Jaleo (1882) By John Singer Sargent. One of the greatest genre paintings of the 19th century. Ranked among the best portrait artists of the nineteenth century, and one of the last great exponents of the au premier coup painting technique, Sargent was revered for his prodigious talent at figure drawing and figure painting - a skill exemplified by El Jaleo (1882), which also showcases Sargent's individual style of Impressionism. Other masterpieces of his early 'Parisian' period include: The Daughters of Edward Darley Boit (The Boit Sisters) (1882); and Portrait of Madame X (Madame Pierre Gautreau) (1884). 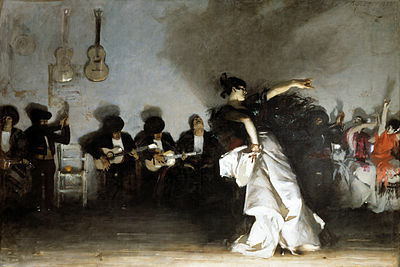 Like El Jaleo, both reveal the influence of Spanish painting on Sargent's modern art, notably its dark colour palette. El Jaleo is one of the greatest modern paintings by John Singer Sargent and illustrates the popular fascination with Spain (Hispanism) of the time. It shows a Spanish gypsy dancer performing a flamenco dance to the accompaniment of several musicians and fellow dancers, seated alongside. The painting - along with a smaller work entitled The Spanish Dance (1882, Hispanic Society of America) came about as a result of a five-month trip which the artist took through Spain and North Africa in 1879. Stylistically, the work is related to a slightly later series of pictures produced by Sargent in Venice, which, like El Jaleo, are marked by dramatic light and shadow, as well as contrasting colours and exotic models. Sargent chose a huge 12 foot by 7 foot canvas as the "stage" for his intended dancer, and called the painting El Jaleo - the Spanish name for a lively solo dance accompanied by castanets. Like his fellow Parisian painters Manet (1832-83) and Renoir (1841-1919) - both of whose most spontaneous paintings were in fact deliberately and painstakingly crafted in the studio - Sargent believed in detailed preparation. He took months to complete the preparatory drawing and sketching for the painting, paying particularly close attention to the dancer's posture, the drapery of her dress (compare the dress worn in Portrait of Mrs Henry White, 1883, Corcoran Gallery of Art) and the play of shadows from what appears to be footlights. Having spent almost a year preparing the composition, the execution of it probably took him no more than a week, such was his technical virtuosity. El Jaleo is painted in a monochromatic palette, except for the orange and crimson of the other dancers (seated extreme right), some small touches of orange at left (candle on chair and palm-prints on back wall) and gold highlighting on the hanging guitars. In keeping with his close affinity for the Spanish painting of Diego Velazquez (1599-1660) and Francisco Goya (1746-1828), as well as the dramatic tenebrism used by Baroque masters like Rembrandt (1606-69), Sargent demonstrates his virtuoso handling of dark tones (compare the solid black of the musicians' hats with the graduated greys of the dancer's shawl), while at the same time contrasting the blacks with the white tones of the dancer's dress, caught in the bright footlights. Moving from left to right across the stage, the dancer is captured leaning backwards in mid-movement, as she salutes her friends with her outstretched arm. The absence of any barrier between us and the dancer (plus the shallow depth of the performing area) helps to maintain the illusion that we are present at the actual event. While the line-up of musicians and dancers, the differing actions of their arms and hands, and the communication from the dancer to her colleagues (extreme right), creates a definite sense of sound and movement - in total contrast with (say) the flat quiet of The Daughters of Edward Darley Boit. El Jaleo is easily the most theatrical and spontaneous of Sargent's major works, and the style of painting it presents is not unlike the naturalist idiom of Impressionist painters in Holland, Germany and Australia. For more, see: Realism to Impressionism (c.1830-1900). In 1882 the painting was exhibited at the Paris Salon under the more explicit title El Jaleo: Danse des gitanes (Dance of the Gypsies). It was purchased by the Bostonian collector Thomas Jefferson Coolidge. Six years later, the work was publicly exhibited in Boston, attracting the keen interest of the wealthy art collector Isabella Stewart Gardner (1840-1924), a Coolidge relative. In 1914, she exhibited the picture in her own bijou museum, constructing a brand new gallery - the Spanish Cloister - especially for it. Gifted to the museum by Coolidge, El Jaleo now hangs in a darkened niche at the end of a long hallway, almost entirely covering the available wall space - one of the most intimate and fitting settings for a work of art in an American museum.  The Ballet Class (1871-4) Musee d'Orsay, Paris.  Luncheon Of the Boating Party (1880-1) Phillips Collection, Washington DC.  Young Italian Woman Leaning on her Elbow (1900) J. Paul Getty Museum.  Boy with a Pipe (1905) Private Collection.  For the meaning of other figure paintings, see: Homepage.